These past few days, I’ve seen a lot of videos about faith in humanity restored. I’m inspired by these videos and they made me cry whenever I watch them. Maybe because I really do believe in the good of every people. As perfectly said by Anne Frank, “In spite of everything I still believe that people are really good at heart.” Yes. I believe that there is kindness hidden in all of us. But there are days that prove me wrong. And this is one of those days. 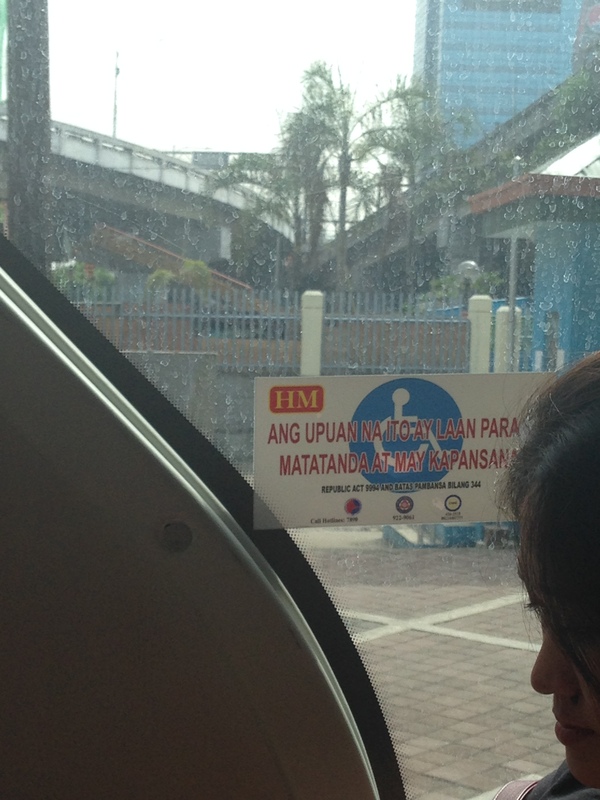 The sticker says, “Ang upuan na ito ay laan para sa matatanda at may kapansanan” (This seat is intended for elderly and disabled). I believe they should include the pregnant there. Anyway, when I look at the people sitting in those seats, fine, they are the usual healthy, young people (4 women and 1 man). It will be completely alright if not for that pregnant woman who just rode the bus and boy, she is OBVIOUSLY pregnant. When she passed by me, I looked at the man sitting in one of those privileged seats. He looked at me and I know he knows what I’m trying to imply but he did nothing. So the pregnant woman stood still in between those privileged seats where there’s nothing you could hold on to except the head of the seats (well, bless you if there’s a handle at the back of those). Then this elderly woman also came and stood beside me. Still, no one dared to offer a seat. Some closed their eyes. Others just stared. I understand. These wonderful people took the effort to lineup for a comfortable seat in the bus. Maybe they are tired and sleepy and want to catch some little time to nap before going to work but hey, if you see that sticker, I believe you should be responsible enough to know that that is a seat intended for people who have special needs and you should choose another seat where you can’t be disturbed. In other countries, if you happen to use those seats, you are forced to get up and offer it to those who it caters. Talking about manners and common sense in here..
And I’m thinking, how can you sleep knowing that someone pregnant and elderly is standing beside you? Sorry to be emotional but, what if it happens to someone you love? Like your mother? Your wife? Your sister? Your daughter? Would you want people to ignore them? And there goes my belief that we Filipinos are respectful people. How can we make a difference in this country if in this small act of kindness, we choose to be numb? While seeing those things, I wanna react. I’m gathering thoughts on my head on what to say to that guy, or talk to the driver and bus conductor suggesting them to be strict on that policy. Oh! Maybe, it’s not a policy. Maybe, they just put that sticker in those seats to be a reminder. A reminder that is up to us if we will follow or not. Sad to say, we always choose the latter. Sad. Very, very sad. Deep inside, I want to do something. I want to stand up for them but I didn’t. Blogging this experience may be cowardice but I know myself. I can be emotional and very expressive of my opinion and I fear that I might say things that are not very pleasing to God. That’s why I came up with this. Maybe somehow, someone might read this and spark a change in his life, then someone, and then someone.. Still, I believe in the good of every people. I believe that we can make a difference. We can’t save the world but we can save that one person who needs help. Like the saying, great things start from small beginnings? And lastly, MEN. Don’t mind us women. We are tough and we can make it. But I beg you to be a gentleman, not to us but to them who needs help. May SHE be pregnant, disabled or elderly or HE that is disabled or elderly. Be that man who is rarely seen today. Kahit sa kanila na lang. Kahit sa kanila na lang. This entry was posted in Life as it is and tagged faith in humanity restored, love, respect. Bookmark the permalink. Stop trying to put your faith or hope in humanity and put it in God alone. What people do is expected. Saying there is good in humanity or there is a little good in anyone is simply not true and not what the bible teaches. Sure you can do good things here and there but deep inside all people are depraved and evil. You should never put faith in humanity or claim there is good in people when the bible teaches there is not. Only God is good and only things we do are good is becuase God is in us working it out in us. People who are not saved or do not believe in Christ are still in their depravity, and any good deeds they do are seen as filthy rags to God bc of their selfish and delusional intentions for doing good things. It is self righteousness. Yeah.. Point well taken. But there is this hope in me that we can all make a difference in our own small ways either we believe in God or not and as Christians we should be the first ones to show that example. I agree with what you said but sometimes people need to be reminded as well. Its ok to tell people they should be kind or whatever but the reality is there is no hope in humanity and all people are wicked and the bible teaches this. There is no good in people who do not have God.